*Prototype stage, available soon ! This is the latest offering from our TubeDreamer line. – Firstly it is featuring a dry-wet mix function, that allows you to blend the overdriven signal around your fundamental clean tone. The overdrive is “dressing” the signal rather than altering it, achieving greater note-definition and dynamic articulation. 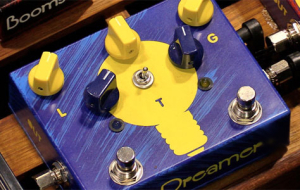 – Accessible through a second foot switch, the second new feature is a “not-so-clean” but very guitar-friendly boost that retains the open, harmonically rich sound of the TD Supreme without compressing it. It also functions as a stand-alone boost, essentially turning the TD Supreme into a 2 in 1 pedal.